Discerning recruitment committees can screen candidates to be certain they are not subject to influences that might impair their judgment as board members. Lack of independence could easily divide and perhaps polarize the board as has happened in our country’s Congress. A candidate who is “sponsored” by a major donor and maintains personal ties with the donor can create a “hornet’s nest” for the recruitment group. There are no easy solutions to these problems. •	The legacy challenge. A director is appointed to the board largely because his family has served on the board for generations, not because of his talent and/or commitment to the mission. If there are too many “legacies” on board, the optimal range of perspectives is narrowed resulting in inadequate discussion of potential actions. •	The chief executive does not keep a professional social distance from the board chair and/or other directors. For example, their families are frequently engaged socially. •	In “prestige boards,” a business or professional person persuades the board to accept a candidate who is business associate because he/she is a “good person” who needs board experience for networking purposes. 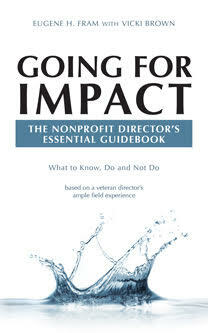 •	A candidate for a directorship has significantly caused problems on another nonprofit board, but a current active director, a friend of the candidate, wants him to be elected so that he/she can be given a second chance. •	Clearly acknowledge the challenges where they exist and then seek new candidates without such encumbering ties. •	If possible, try to confront the situation directly, if it does not cause a schism within your board. Develop a policy, not a rule, which allows someone to open discussion if one of these issues arises. •	Make independence one of the characteristics desired for board candidates and clearly acknowledge what is meant by the term. independent. As long as a board has enough directors who are not beholden to other interests there should be no impairment in achieving the organization’s goals. This type of subtle influence is rarely discussed, and to my knowledge, has never been researched. But, if left unattended by nonprofit recruitment committees, it can lead to political board schisms that seriously impact the organization. Thanks for sharing with your students.